The Archbishop of the Church of Uganda, Rt Rev Stanley Ntagali has urged parents to watch over their children during the festival season and protect them from defilers and kidnappers. In a Christmas message issued on Friday, Archbishop Ntagali said many parents have left the role of child upbringing to house helps, leaving their children at risk of being defilers. “Many children suffer because of bad decisions by their parents. We want to challenge parents to give more time to their children. There are many children who are left on their own or often in the care of maids and teachers. Parents have abdicated to others their God-given role of raising children,” he said. “Children who grow up watching a drunk parent or abusive parents continue the cycle of violence and abuse,” he added. 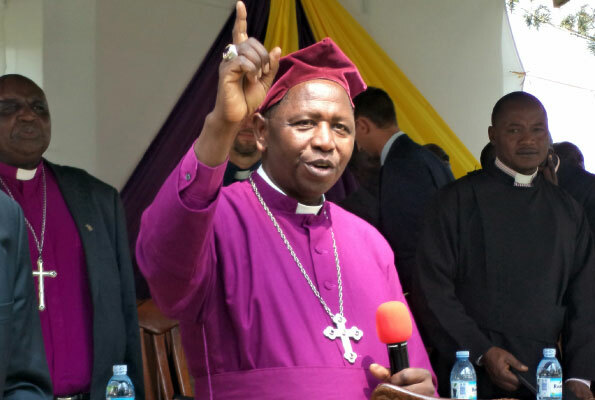 The Archbishop added that the Church of Uganda, in conjunction with the other faiths will continue to fight against homosexuality whose sponsors he said are continuing to fund many government programs. “We must continue to speak out against all the ways the UN’s pro-promiscuity, pro-gay, and pro-abortion sexual agenda is trying to infiltrate Uganda, both through re-writing government policies as well as through UN-funded NGO’s. Specifically, we are opposed to incorporating their programme on Comprehensive Sexuality Education into Uganda’s national curriculum. We fully support UJCC’s efforts to intervene on this matter,” he said. “Too many parents and other adult relatives are so greedy that they go to the shrine and engage in witchcraft that puts children at risk and, even worse, causes children to be sacrificed. This must stop,” he added. I’m reaching out to you today to wish you a very happy Christmas. In the midst of all your final preparations of shopping and cooking, please take time to remember Jesus, who is the reason for this season. The Bible says, “God did not send his Son into the world to condemn the world, but to save the world through him.” (John 3.17) That’s why both the Gospel of Matthew and the Gospel of Luke make sure to tell us that the child born to Mary will be called Jesus. The name ‘Jesus’ is the Greek version of the Hebrew name ‘Joshua,’ which literally means “the Lord saves.” The meaning of Jesu’s name tells us who He is. He’s the only one who can save us. As we come to the end of the year and reflect on the past year, many of us can see how we have tried to save ourselves from the challenges we face in our lives. We have tried to be our own saviours. Have you realized yet that it doesn’t work? We can’t be our own saviour. And that’s why God sent his Son, Jesus, to save the world. To save you and me. Fundamentally, Uganda’s problems are spiritual. We have allowed evil to flourish in Uganda at all levels, including our families. This is why we have made the past two years in the Church of Uganda the Year of the Family. The transformation of our country begins when individuals and families recognize they can’t be their own saviour, when they invite Jesus to rescue them, and when they pursue righteousness and holiness in their families. This Christmas, I urge you to stop trying to be your own saviour and to surrender your life to Jesus as the only One who can save you. I want to remind you that the Provincial Assembly declared 2019 to be the Year of Children. As we conclude the second Year of the Family, we want to focus next year specifically on children as great gifts that God has given us. Children are among the most vulnerable members of our society and the challenges they face reveal to us how so many of Uganda’s problems today are fundamentally spiritual issues. And, Christmas tells us where to find the solution to these big spiritual problems we have. Far too many children suffer because of bad decisions by their parents. We want to challenge parents to give more time to their children. There are many children who are left on their own or often in the care of maids and teachers. Parents have abdicated to others their God-given role of raising children. Children who grow up watching a drunk parent or abusive parents continue the cycle of violence and abuse. There are many Children who are traumatized after death of a parent and get mistreated or abused by the step-parent and, at times, relatives. Many children go to school on an empty stomach and end up facing the wrath of teachers for performing poorly simply because they couldn’t concentrate because of hunger. There are many cases of defilement that go unreported because many adults prefer to keep it a secret so as not to bring shame on the family. This is very bad because it further victimizes the child who has already been a victim of defilement. Many youth and teenagers, who face physical changes in their bodies, receive guidance too little or too late on how to honor God with their bodies; they end up in teenage pregnancies, early marriages, and victims of homosexual predators. In the end, we are perpetuating poverty and not breaking the dysfunctional dynamics of generational sin in our families. Furthermore, we must continue to speak out against all the ways the UN’s pro-promiscuity, pro-gay, and pro-abortion sexual agenda is trying to infiltrate Uganda, both through re-writing government policies as well as through UN-funded NGO’s. Specifically, we are opposed to incorporating their programme on Comprehensive Sexuality Education into Uganda’s national curriculum. We fully support UJCC’s efforts to intervene on this matter. Too many parents and other adult relatives are so greedy that they go to the shrine and engage in witchcraft that puts children at risk and, even worse, causes children to be sacrificed. This must stop! Faced with all these and many more challenges the theme for the Year of Children will be “Take Care of this Child.” (Exodus 2:9) As the Church we want put the improved welfare of children at the centre of every ministry so that every child is given an opportunity to grow and excel. My brothers and sisters, these are only a few of the spiritual issues facing Uganda today. We cannot save ourselves. Only the One who was born 2,000 years ago in a feeding place for animals in the small town of Bethlehem – the One who was named “The Lord Saves” – only Jesus can rescue and save us from these problems. Will you turn to him today and make this Christmas the beginning of another revival we so desperately need. I send warm Christmas greetings to His Excellency, Yoweri Kaguta Museveni, President of Uganda, Hon. Janet and their entire family and all our government leaders. All the Bishops and their wives, the Clergy, Lay Readers and Christians of the Church of Uganda. I also send my sincere greetings, along with prayers for a blessed Christmas for our Roman Catholic, Orthodox and Pentecostal brethren, and all those who have looked in hope for the coming of the One who will save people from their sins, Jesus the Christ. The Most Rev. Stanley Ntagali, ARCHBISHOP OF CHURCH OF UGANDA.